I've been with WA before and have made the decision to come back. I have some "unfinished" work to complete as my goal is to build a successful home business the right way with WA!! This time patience Will be a virtue! Having been involved in previous business opportunities seen on the Internet and getting burned with a few, without question WA is THE best one out there as far as owning an online business. I have also, due to past family obligations involving a parent afflicted eventually with 3 strokes and acting as her care-giver, (she has since passed); been involved with work from home telecommuting opportunities. I've now decided that with the scars having healed, (exchanging dialogue with rude people on the phone) that I'm no longer willing to "work for the man" in answering calls (inbound) in support/help ideals or cold calling people (outbound) trying to get them interested in a product. I'm now fully invested into "being my own boss" the very principle in which WA was founded by Kyle and Carson. We here all have the unique opportunity to become truly successful and learn so much throughout the entire process. . So, I'm ALL IN and this time I'm going to do whatever it takes to make my journey here at WA a most successful one! Hi Bryan. What I strongly suggest that you do is that starting with phase #1 of the training, you take your time going through the material. Eventually you will come to the decision, on your own as to what niche you would want to choose in developing your business. Whatever this niche is, (golfing, bicycle riding, fitness, music, clothing, etc) it should be one that you have a passion for in addition to knowledge about whatever product(s) you would sell. Bryan, whatever you do take your time with the training. Far too often, new members look to make money in their business almost immediately after they set up their website and through writing a few content articles. It won't happen and this is explained in the training. Once Google recognizes that you are fairly consistent with posting new content on your website, your ranking compared to other site owners who also promote the same niche will improve. As your ranking improves, you will begin to see more visitors come to your website to see what you would have to offer. Remember Bryan - through all of the knowledge that you will learn here through the training, understand that you're involved in a marathon and not a 100 meter sprint. If you need any help, don't be afraid to contact either me or anyone who you get to know here at WA! Hi Brian. Here is a link to phase 1 of the training: Online Entrepreneur Certification - Getting Started Level 1 . It is simple to find as on the left hand side of the page below your Wealthy Affiliate ID can be found such items as Dashboard, Training, Websites, Live Events, Research, Live Chat and Help Center. On the training choice you only have to click on the word "training", (or on the arrow ">" found to the right of the word and you would immediately be re-directed to the link that I posted above! Good luck with the training, Bryan. Take your time, if necessary going through it more than once. If you have any questions, please do not hesitate to ask anyone in the WA community! Hi Bryan. First of all, I'm not sure what your niche is, so it's difficult to come up with an answer to that question. Whatever niche that you do decide to pursue, and something that is emphasized in the training would be that you do a google search to find good affiliate programs that would have some products suitable for you to promote. Again, understand that first you must establish yourself in your niche by initially writing relevant content on your website where in the beginning you're not trying to sell anything. Allow your readers to come to the conclusion that you're an honest and trustworthy individual as seen through your content. Only after a while - say a month or two would you begin to promote products within whatever niche that you would have chosen as a basis for your business. In fact some affiliate programs, (Commission Junction comes to mind) would not accept business owners who have brand new websites. Using Google Search Console statistics, (and there is training on this aspect found at WA) you would have to prove to these affiliate programs that looking at your website, you have consistently earned a number of daily visitors, have a good click-through-rate, (people who actually do click on articles posted on your website when finding them through a keyword based google search), and etc. It does take time and patience, Bryan. It's why factually it is preached at WA, that building a productive, legitimate, and trustworthy business is NOT something that can be done in a manner of weeks - despite the lies that get-rich-quick programs often lead desperate and naive people to falsely believe. I hope that this info helps, Bryan! Hi Jeff, we chatted earlier in the blog post about Too Much content and I appreciate all your advice! Sorry to hear about your loss. You’re very special to have taken care of your family member. I’m a traumatic brain and spinal cord nurse so I’ve had lots of years with stroke patients. I also work in hospice. You just went through all of it. I’m sorry again..
I’m glad you came back to WA! I love it hear so far! I have so many ideas to write about. There’s not enough time in the day! We will prevail! No doubt!! Hi Kristy. Thank you so much for your very kind words. My mom passed away 6 years ago, March 2012 as a result of a 3rd stroke that had occurred within roughly about a 5 year period. My Dad passed away years ago, back in 1994. Not a day goes by where I don't think about both of them. It was my distinct pleasure in providing you with advice about the length of your content written in your website articles. After all, we're all here to help each other! I truly hope that things going exceedingly well for you in your online business here at WA, Kristy! Hi JeffL61, It's nice to know you. For the past 2.5 years I was caught up in the “Shiny Object Syndrome”. Gotten beaten up mentally and lost money, but I was able to fight my way out. I’m still somewhat new to online marketing... looking for the KEY, but now realized, I’m the Key to my success and with the information offered in Wealthy Affiliate I’ll unlock it before the end of 2018. Well, you've come to the right place by joining WA. This program is 100% legit and provides the best educational training, tools and community support of anyone. I understand where you're coming from as my first venture into trying to make money in an online business was back in 2005. I foolishly joined a company that promised every member would become rich through simply following their proven system. It was a bunch of b.s. as eventually high ranking members of this fraudulent/scam company were names as defendants in a number of class-action lawsuits enacted as a group by low-level members coming from various states in the U.S. and none of whom earned a dime in this company. I only wish that the state that I lived in at the time, Connecticut, was involved in any of those lawsuits as I definitely would have signed my name on the dotted line, being one of the claimants going after those crooked shysters. Yes, it is very unwise to get caught up in the "Shiny Object Syndrome", still seen in bogus business ventures that still pollute the Internet. Best wishes to your success here at WA, sir! Hi, Madek! Thanks for the message. I have chosen to follow you over at your G + account. You're awesome! Wish you success with this marketing venture in WA. Cheers! Thank you for the follow and the welcoming message. I don't mean to tell you something you already know, but you have A LOT of heart, wow. It's contagious. You keep that big guy beating and there'll be no stopping you. I hope I can keep up with all you amazing people here at WA. I realize I have a long road ahead of me but I've got a knack for perserverance and a pretty good head on my shoulders so I think I'll be around for awhile. =) Until we meet again! Wow, I am taken aback by your wonderful message, Jayna! Thank you so much! As long as you're willing to keep working at it Jayna, as you stated that within your personality you have a knack for perserverance, than I just know that down the road you will build a very profitable online business for yourself! Even previously being burned you did not give up, I like that. As you have been here awhile I will have a look at least at one of your websites, must be a good and mature one. I hope you will have a look at my latest WA post on to Follow, there you can see what I think about it. Some time ago I decided I would only write 1 post a month, that's it. This I always say to new people I meet here. In my WA post on the Spanish priest and the world library, you will find it a source of unusual information, good when writing for your website. As opposed to my bicycling website: lovetocycle57.com. I have abandoned that site since late December of last year. The bicycle niche is really not what I thought it would be regarding popularity. There are very few affiliate bicycling programs, other than Amazon. Amazon and other affiliate programs in the bicycle niche are quite cheap only providing a person who promotes any of their products with a 4% commission rate. These programs that I hear that give out commission rates of 30, 40, or 50 %, (some even higher) to people who market their products I'd love to know exactly WHAT/WHERE they are. They're definitely not in the bicycling niche! I expect shortly when I see that I am no longer making any sales through Amazon that I'll just delete the entire website. As it is, some technical issues have arisen regarding my lovetocycle57 site's appearance online that I just cannot be bothered to spend the time fixing or Tech Support here at WA to look at it. I have really put all of my entire efforts now on my other website, the first one mentioned above. Referrals are coming in but like a lot of other members here who are not close to the Super Affiliate stage, my percentage in converting them to actual sales is much less than the 12% average as Kyle and Carson states that it is - or at least for them and other Super Affiliates. Take care and the very best to you in your business, Taetske! Am back from a most interesting film.Ways to save the planet, that is on my wave-length. I will visit your other website in the very near future, promise. Well, here I am again, was out as Wednesday is village day. On coming home I got a message from Sarah and perhaps this time I can help. I will now go and have a look at your website. I can not load your website. It does not want to open and I see on the address bar you do not have the green security lock. Thank you for bringing this to my attention, Taetske. For some inexplicable reason this is now the 3rd time since last Sunday that this issue has arisen. Because of reading your message, I went to my site and cannot get to it either. This has become infuriating. I have contacted WA tech support previously each time it occurred. Magically, within minutes the site appeared. Still, I don't think anyone from the tech dept. here has come up with a reason as to why it is happening. I will contact WA support right now. If they can fix it, I will also insist that they look into exactly why this has been happening. Thank you for bringing it to my attention although as I was just about to write out an article and eventually add it to my site in a few hours I would have noticed it myself! Let me know when I can go to have a look. Hi, Taetske! As of this moment, my site is back up. It always happened, counting the two previous times, right after I submitted a ticket to WA support. Someone, within about 3 minutes after I submitted the ticket got right back to me asking that I try to get in. For the 3rd time since this first occurred this past Sunday I was successful. Still, as I replied back with a reply to support staff, I need someone to investigate as to why this has been taking place. Apparently the first time on Sunday, it was for a more lengthy period. I noticed a problem when I got an email from the gravity site stating that on Saturday they were unable to crawl through my website to perform their daily scan. I also noticed on my Google Search console that on Saturday they also were unable to crawl through my site, reporting it as a robot.txt error. Saturday, I chose not to work on my business and the issue was only brought to my attention with that gravity email appearing Sunday morning in my email inbox. After reading the gravity message, on Sunday I still was unable to log in and notified WA support. Within 5 minutes, as was the case just now apparently the problem had resolved and I could log in. The same thing also happened on Monday. This has become annoying, really the first time I have had this issue with my website since I first created it in June 2015. I just want WA support staff to come up with some solid answers instead of on, each occasion, applying a band-aid as their only attempt to fix the problem. Thank you for bringing it to my attention in your first message, although eventually I would have found out for myself later on today. Hi, again Taetske. I just got back a second reply from WA's support staff. As to answering my question as to why this has been happening, one of their support staff people stated that the "problem" could be traced back directly to something wrong on their end regarding hosting. So, I guess that this "problem" has happened 3 times since Saturday. I wonder if somehow I've been the only member here at WA whose website has been effected by this "problem". I've not seen this issue being raised by anyone else in an article posted on the dashboard at all this week. So, my site is now up. Hopefully, not to have further "problems" taking place in the future! Happy to hear all is back to normal. I have not heard about this problem from anyone else. Today I will follow up on my promise and visit your website. Hi, Taetske. Actually the same problem reared its ugly head again last night - Wednesday. On a lark while watching a baseball game on television here in the U.S., on my smart phone I tried to access my website. I could not do so. I then went onto my desktop computer, logged into WA, went to site manager and tried to log into my site. I could not do so. I went to a different Internet browser and typed in my site's URL. Again no luck. I then immediately submitted a ticket to support staff. Within minutes, someone asked me to try logging into my site again after apparently fixing things on their end. I finally was able to log in. It was the second time it happened on Wednesday, the first time you being the person who first noticed the problem and sent me a message. It would be the fourth time since early Sunday morning that this has taken place with my website. On that occasion as I've mentioned it to you before, I believe that my site had been down since Saturday when the Gravity app could not do their daily scan on my website and sent me an email Sunday morning informing me of the problem. Last night after the problem had been fixed, I again sent a second ticket to WA support to ask them why this has repeatedly been taking place. I just don't except the fact that the problem is on WA's hosting end, the only answer they have given me. As you just stated now, to your knowledge no has else here at WA is having this same issue. I noticed that no one has posted an article on the dashboard asking if anyone else is having this same issue. So, I woke up this morning and turned on my computer immediately coming here to WA. I would have expected someone from the support staff to have responded back to my second ticket that I submitted last night to provide me some more details about this problem - other than the fact that for some inexplicable reason the problem lies completely on "their end". I received back no response as no message appeared in my WA inbox coming from the support staff. I had a similar issue back this summer when inexplicable http 404 errors began occurring on this site. I contacted WA and one of their staff member's solution, done without my permission or knowledge until after the action had been completed, was to install and activate a new sitemap plugin on my site believing it would solve the problem. It did not and in fact made things worse. I repeatedly contacted support staff as in addition to that problem, suddenly none of my new content articles, to which I add about 3 or 4 per week were being indexed especially over at Google's search console. My average position ranking dropped for my site. Yet, none of these supposedly trained support staff personnel had a solution other than to contradict each other every time I contacted them which for a while averaged out to several times per week. I finally contacted Carson himself, as he specializes in computer I.T. I told him everything that had been going on including what that one support staff member had done, changing my sitemap plugin on my site without first consulting me. Frankly, Taetske I was livid and let Carson know how angry I was as this took place over about a 6 week period. Carson got back to me, apologized and made adjustments to my site himself including installing a different sitemap plugin himself. Now this problem with my site being down repeatedly this week is taking place. If it continues I'll contact Carson again, if necessary today should it happen one more time. Frankly, it is inexcusable that this keeps occurring, and furthermore no one from support can give me a clear reason as to why it's happening. It's the first time since I've been a member here at WA that I've become upset at the apparent incompetency of the support staff whose jobs are to come up with solutions about website problems. Hope that you're having a great day. It's not quite 8 am here where I live on the east coast of the U.S. I know that, being 6 hours ahead of us it's already in the middle of the afternoon where you live in Europe! Well, this time everything went smoothly so I could visit your website. A good crisp website, I am sure you will be successful with it. Hi, Taetske. Thank you for your wonderful comments as you finally were able to get to my website. I was notified that an organic comment was posted on one of my articles a few hours ago on this site. I'm keeping my fingers crossed that whatever caused my site to go down over the past several days has now been fixed by support staff. To reciprocate your support I went to visit your two websites as well. Beautiful and scenic homepage,especially regarding the EarthTreasures' website. Your second website, specializing in antiaging remedies I'm sure will continue to attract readers interested with what you have to offer that would provide something invaluable regarding their lives. You write so incredibly well looking at your content articles! I wish the absolute best for you with both of these websites well into the future! Thank you, Jeff, for the compliment, we will be in contact. Once again thanks for giving me really useful help concerning Google+ yesterday. Thought it would be nice to get to know you a bit now as I am a Follower of yours. After all hardships you have gone through, I'm relieved to hear that you are feeling better now and are able to focus on being your own boss. I wish you all the best and may you achieve your goal. WA is really a wonderful place, a unique learning platform with an awesome community. I'm happy to have found this opportunity building my own online business as well. Thank you, Pernilla for your kind and very thoughtful words. I'm glad that I could help, being aware of all the training that Robert provides to others. I have used his training about Google + myself, and often. Despite the occasional melodrama coming from a very small subset of members here at WA, (and no community could be labeled as being perfect) what this program has to offer is unparalleled by anyone on the Internet. I wish you the best as you continue to grow your online business! Thank you for the follow back! Hello Jeffrey,♫Welcome back! Nice to meet you ツ I wish you a lot of learning pleasure and fun on WA. Thank you for adding me to your network. God Bless You OK! Good Mornong OK! (STARYS AT 8:00 AM TO 9:00 PM) (CALL 5 MIN B4. OK)!! (MY MOBILE # (626) 409-5832) (CALL MORE DETAILS OK)!! it looks like you're doing something right.... 3,310 friends. If you can't make it with that many friend, I don't know what to say. As they say, you have your own Tribe:) Get a product or two and promote, promote, promote. With the right product (s), you could make a living. Do you know what monetizing is? If not, find out. Actually, you can Google it. I wish the very same for you here at WA as well Dave. Thank you for the follow which I have reciprocated back to you! No, for some reason I have always had that number after various screen name/email names. I turn 60 in August. 1961, the year my sister was born is actually the first year that I can still cognitively remember. I remember my 4th birthday that year and the small neighborhood party that my parents threw for me. With a new sister, (then about 6 weeks old) perhaps my parents wanted to give me some attention as well by having the party. Trust me with all the grey hairs that would be seen were I to let my hair grow out, I am a long way from being 30 - 45 years old. 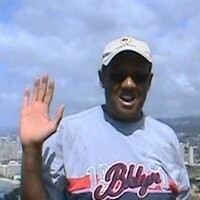 My WA profile photo was taken on top of Diamond Head Mountain in Hawaii back in the fall of 2012 after I had hiked up to the top. The 360 degree panoramic view was out of this world! Thank you so much for your kind words, Katie. Not a day goes by when I think of both of my parents - my father passing away back in 1994. I wish you the absolute best in your online business ventures here at WA as well! Hello I see that you have been with wa affiliate for almost two years? how are you liking it? have you earned any money online yet? I am happy to be apart of this community I have be been in the community going on 1 month now. I am so excited to learn and see what this community has in store for me, can't wait to see what happens next for me! Follow me back! thanks! and check out my website. www.themelaninqueen.com thanks! Hi JeffL61. Thank you for the following. Life can be a funny thing by leading us down paths that's not particularly in our plans. But when we persist like you have, we find our way back on the road stronger, wiser, and more determined than before to reach our goals. Life happens....but can be medicine to our soul! Thank you for sharing your story. Thank you Angela for your very inspiring message! Persistence indeed does reap its fruits! No one said life was guaranteed to be easy and unfortunately too many people who seek to make money online having to put in little effort are the ones suckered in by these get-rich-quick schemes. Work, toil and sweat = success! Like the old Porsche luxury sports car commercials once stated - "there is no substitute"! I wish all the best to you as well, Angela! My appreciation message to Members willing to spare their ample time just to following me together networking under WA. Thank you sir! I wish the same for you! Thank you Mahir! I wish the same for you as well! I actually was apart of WA years ago, and back for GOOD this time too! I´m glad you got clarity on creating your own online business. WA is certainly the place to be! Thank you Tianah! All the best to you here at WA! Two Year Anniversary at WA!